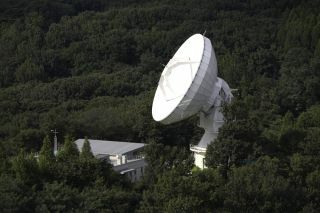 Researchers linked this radio telescope in Seoul, South Korea, with another Korean scope and three dishes in Australia to create a system that functions as a 5,000-mile-wide telescope. Radio telescopes in Australia and South Korea have linked up for the first time, forming a mega-instrument roughly 5,000 miles (8,000 kilometers) across. The transcontinental scope should have roughly 100 times more resolving power than NASA's Hubble Space Telescope, researchers said. It continues Australia's astronomy partnership with Asia; the country has also made similar linkups with Japan and China over the years. "This is another step in Australia's ongoing collaboration with Asia in the field of radio astronomy," Philip Diamond, astronomy chief at Australia's national science agency, known as CSIRO (Commonwealth Scientific and Industrial Research Organisation), said in a March 15 statement. The five radio dishes observed the same target — a galaxy 3.5 billion light-years away known as J0854+2006 — simultaneously for five hours. Their data was streamed in real time, at a rate of 64 megabytes per second, to Curtin University in Western Australia, where it was processed on the fly. Researchers were pleased with the results. "We were observing at a high frequency, which can be challenging for this technique, but the experiment worked extremely well," said CSIRO's Chris Phillips, who organized the tests. The linkup also demonstrated the sorts of techniques and technologies that will be required to make the Square Kilometer Array a reality, researchers said. The SKA, a future mega-scope with an estimated price tag of 1.5 billion euros (nearly $2 billion), will connect 3,000 separate dishes, each about 50 feet (15 meters) wide. SKA officials have narrowed the location of this central core down to two nations: Australia or South Africa. CSIRO scientists hope Australia's success with the Korean and other Asian telescope connections put the Land Down Under in the lead. "Australia has many decades of experience with these long-distance linkups," Diamond said. "And we are committed to scientific partnerships with countries in our region and elsewhere — another reason why Australia would be an excellent choice as SKA host." SKA management is expected to choose a site sometime this year. Construction is slated to begin in 2016, with the array becoming fully operational in 2024.